Situated in Miami Beach, Aqua on Allison Island is Miami’s tropical oasis. It is a small island village set on 8.5 acres of land that features some of the most sought after Miami real estate. This guarded close-knit community features the ultimate in luxury and privacy. The people who live here are very friendly and love where they live. Aqua on Allison Island is a collection of some of the most creative and successful architects, designers and developers who have created a city within a city. This creative and savvy group of professionals worked individually yet as a cohesive unit to create an unbelievable assembly of condominiums and private homes that only a select few live. Up until 1912, Allison Island was nothing but a small clearing in a swamp of mangroves at the mouth of Indian Creek. Because it was inhabited by nothing but alligators and other “swamp creatures,” no one ever thought about developing it. Then in 1912, Carl Fisher, who began developing Miami Beach, decided to buy Allison Island as a tribute to his good friend and partner, Jim Allison. Allison tried unsuccessfully to develop it several times. But until 1926, nothing succeeded. At that point, he began to develop a luxury, “state of the art” hospital for the wealthy Miami Beach residents. But the Hurricane of 1926 (Great Miami Hurricane), a category 4 storm, destroyed all hopes of such a development when it flattened the hospital. 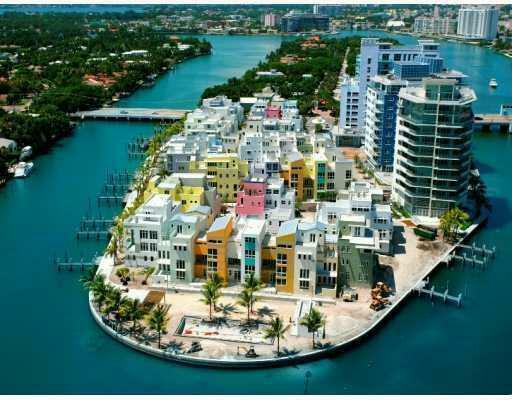 This small island, long and skinny in its shape, sits directly between La Gorce Island and Miami Beach. Just a short drive from Bal Harbour and North Bay Village, this quaint little paradise sits at the mouth of Indian Creek. 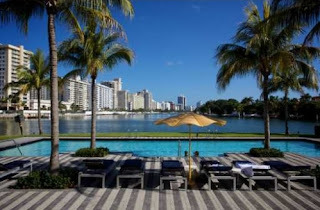 While it has a feel of being far away from all the action of Miami, it is very close to much of the action of Miami. Luxury is the number one goal at Aqua on Allison Island. The amenities at any Aqua property are all about comfort and indulgence. There are so many awesome conveniences for the residents and their guests that include a state of the art fitness center with a large patio that looks out over the water, 24-hour security and monitoring of the private entrance to the community, beautiful heated pools and a children’s pool, a children’s center, walking and jogging paths throughout the island, private docks and so much more. For Aqua residence amenities, luxury continues to be at the forefront of the features of this high-end Miami real estate. In terms of the residential design, homes have a contemporary style with private garage, wrap around balconies, and high ceilings of 10 feet. As for features, residences offer designer kitchens with high-end fixtures, large open rooms, floor to ceiling windows that look out over the water and the rest of Miami, and more. Everything about Aqua on Allison Island is so breathtaking and amazing. From the inside out, everything has been well thought out with the home owners in mind. 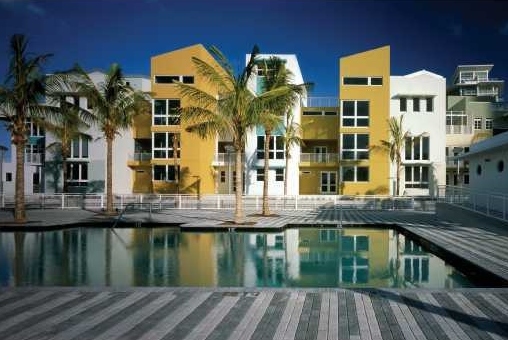 Aqua at Allison Island real estate is a combination of condominiums and private homes. There is a striking yet subtle art deco design throughout the island with a color scheme that has a tropical feel. While so many have the aspiration to live on the island, only a lucky few get to call an Aqua property home. There are 46 private homes in the form of individual condominium homes and townhouses, and 105 units in three mid-rise condominiums each with 11 stories – The Spear, Gorlin and Chatham. The Spear offers the largest potential for buying as it has 60 residences inside while the Gorlin and Chatham are slightly more exclusive with only 29 and 16 homes in each, respectively. Spear Condo has a unique appearance where it almost seems to float in the water and features colors that blend or compliment the surroundings. There are two to four-bedroom homes inside this 11-story building that range in size from 1,367 to 2,752 square feet. List prices fall between about $900K and $1.5 million. As for the Gorlin Condo, its 11 stories encompass 29 units ranging in size from 1,316 to 3,442 square feet and featuring three bedrooms. Its design compliments its sister properties and offers list prices that typically start at about $1 million and climb to over $1.5 million. The Chatham Condo is the most exclusive of the three buildings with only 16 units in the 11 story building. It sits on a multi-level parking structure. 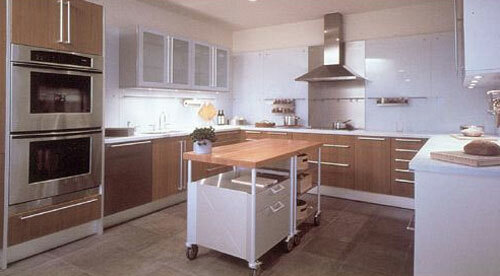 The units have a loft-type feel and offer two and three bedrooms. Sizes range from 1,957 to 3,427 square feet. This building is much more exclusive and rarely has units available for sale. In terms of the individual Aqua homes, they range in size from around 2,000 square foot condominium home to over 4,000 square feet for a townhome. The main draw to these private residences is that they have an individual style and design. List prices range anywhere from $1.2 million to well over $2 million. Eight homes have sold in the past 12 months with sale prices ranging from the upper $500s to over $1.2 million. While the average number of days on the market sits at about 190 days for these recent sales, the spread is all over the board with some selling within as little as five days while others took over one year to sell. Aqua real estate is an excellent investment as any property that hits the market as a rental is swiped up in a quick manner. It is such an awesome place to live that there are Miami residents who will rent property here. There are Aqua rentals available but never more than a couple at a time. When one does appear, monthly rental rates range from around $4,500 to over $10,000. 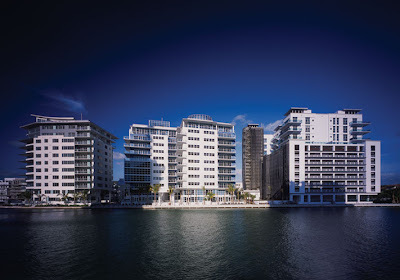 After all, Aqua Allison Island is very exclusive and the rates reflect that. To live at Aqua on Allison Island is truly living the Dream. This city within a city offers exclusive Miami real estate for those who are lucky enough to buy here. Take some time and visit the island to see what it is all about.